VelaShape III is a non-invasive body shaping treatment used to reduce cellulite, as well as slim the area around the stomach, hips, and thighs. The machine combines four different technologies – infrared, bi-polar radio frequency, pulsed vacuum, and massage rollers – to improve skin texture and reduce overall volume of the treated area. You have the option to undergo one longer treatment session or three shorter ones. The results we get from VelaShape 3 are nothing short of amazing. 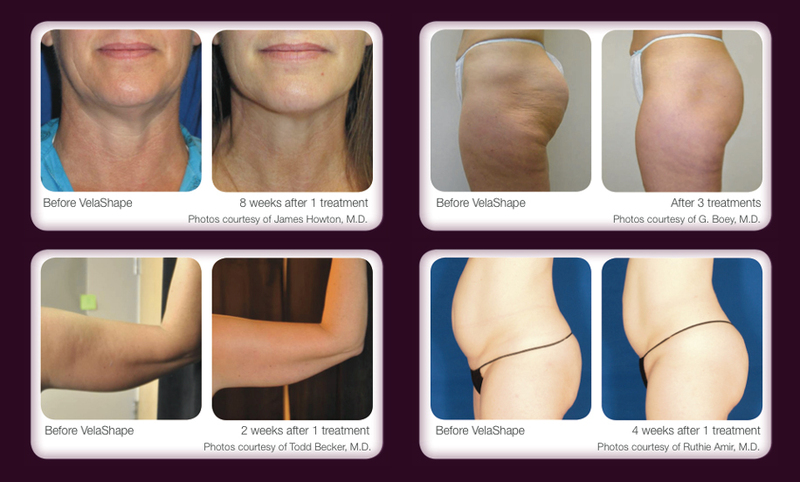 Below is one example of cellulite reduction after 3 VelaShape treatments. If you have cellulite and it makes you self conscious or embarrassed, we have a real solution that is proven in clinical trials and FDA approved for cellulite reduction. If you would like a free consultation to see how this works, we would love to talk to you about this, please call 02 4647 8711 now. After you lie down on a table, we will apply lotion on the area you’re being treated so that the VelaShape III device can easily move over it. The device comes in different sizes and designs for different treatment areas, so we will choose the appropriate handpiece and then evenly glide it across your skin. The head of the machine uses a pulsed vacuum to pull tissue closer to the energy source, as infrared light heats the fat cells in the targeted area. This combination of technologies increases the metabolism of the fatty area, resulting in smoother skin and circumference reduction on the target area. The length of individual VelaShape III sessions vary depending on the size of your treatment area. While people most commonly get three bi-weekly treatments, you might have the option to undergo one longer session instead. You can expect to see improvement in the treatment area in as little as two weeks, with the best results at around 10 weeks. Clinical results showed an average fat loss in the stomach of 2.5cm after a single treatment, or up to one whole dress size. As far as upkeep, periodic maintenance treatments are recommended following the initial treatment(s). Results will last longer if you follow a balanced diet and exercise plan. What Does VelaShape III Feel Like? VelaShape III has been described as feeling like a warm deep-tissue massage. The treatment can be adjusted to ensure comfort with little to no post-procedure downtime. What’s the Recovery Time After a VelaShape III Treatment? The VelaShape III treatment is safe and effective for all skin types and colors. The ideal candidate is normal to overweight, with cellulite around the stomach, hips, and thighs. It’s important to note that VelaShape III is not intended to be a treatment for weight loss, but instead for tightening and contouring the body. If you’re considering the procedure, you should be committed to a healthy diet and exercise regimen before and after the treatment in order to achieve the best results.